Some used to joke that ITE stands for "It's the end", but the growing number of Institute of Technical Education students who go on to further their studies or helm successful careers has challenged this perception. Far from being a school of last resort, it is now a place of choice, and not just with secondary school students. More former ITE students are returning to ITEs to do something they once thought unlikely: teach. As of last year, one in four of the teaching staff at ITE was a former student. This means 394 of its teaching staff possess ITE qualifications, a 35 per cent increase from 292 a decade ago in 2007. These teaching staff fill a range of positions, from lecturers to course managers to teaching associates. 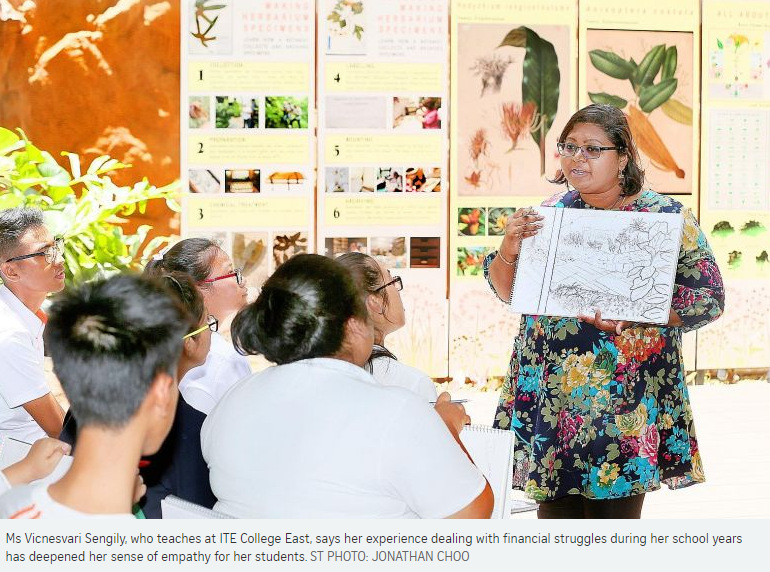 ITE said it does not give its former students priority for teaching positions but sees the value in having them guide the younger generation, as some have gone through similar struggles and can relate better to the students. Ms Vicnesvari Sengily, 42, opted to enrol in ITE back in the 1990s as it allowed her to earn allowances that would help with her household expenses. Her father had liver problems and her mother juggled two jobs as a cleaner and factory operator. At ITE Balestier, she studied business and office skills and later, building and drafting. The courses enabled her to go on paid internships that kept her financially afloat. After school, she also had to help care for her brother, who has polio. "It was hard for me to focus on my studies because of all these issues," said Ms Vicnesvari, now an environmental services lecturer at ITE College East in Simei. Her experiences have deepened her sense of empathy for her students. Some of them do not go to school as there are days when they cannot afford the bus fares. Others are unable to shower at home because their parents did not pay the utilities bills for their rental flats. "So I give them $10 each time if they need it, but I also teach them the value of money. They do pay me back whenever they can," she said. Her students feel comfortable enough to confide in her because they know she has had her share of rough patches in the past. She shared with them how she used to play truant in school, for instance. Besides providing emotional support, Ms Vicnesvari also shapes her lessons to suit her students' learning styles. "I am a visual and kinesthetic learner and many of them are too. They are motivated when they have problems to solve," said Ms Vicnesvari, who won an ITE award for teaching excellence last year. So when students told her the plants in their rooftop garden were drying up as no one had time to water them frequently, she got her class to think of ideas to tackle the issue. The students came up with a portable irrigation system that automatically spurts water, using a timer. In Ms Vicnesvari's case, she returned to ITE after working for a decade at National Parks Board, which had earlier awarded her a scholarship to study landscape architecture in New Zealand. Ms Jessica Tan, 28, however, returned to ITE to teach shortly after graduation. After getting a certificate in Western culinary skills from ITE College West in 2009, she worked briefly as a chef at Universal Studios Singapore. She returned to ITE in 2011 to take up a diploma in culinary arts with restaurant management. She did well enough for Les Amis Group to sponsor part of her studies. She then worked at Les Amis restaurant, dabbling in French and Spanish cuisine for 11/2 years before returning to ITE again, this time as a lecturer in Western culinary arts. "I was inspired by my ITE lecturers and I knew from early on that I wanted to be like them," she said. Ms Tan was especially touched when her lecturers went the extra mile for her. "When I first graduated, it was during the financial crisis and I felt lost because I couldn't get a job. They asked their friends for job opportunities for me," said Ms Tan, who now coaches her students for local and regional cooking competitions. ITE students say they appreciate having teachers whose very own experiences underscore how studying at ITE is hardly a dead end. Mr Muhammad Danish, 20, one of Ms Vicnesvari's current students, said he has lost count of the number of times he has spoken to her after class about his family troubles. He said: "It's very reassuring that she was formerly a student here, yet she went on to become a lecturer. It shows that we can also have a future if we choose to work hard."